Blog – East Coast Wahines - A community for girls and women who love the ocean, beach, and surfing! Hi everyone. The East Coast Wahine Championships ran from 1997-2011. It was the first all female surfing event on the east coast and one of the longest running. Unfortunately things change and we weren’t able to run in 2012 and have closed up shop for good. There’s another group of folks starting up a women’s event in Wrightsville Beach this summer of 2013. This event, The Wrightsville Beach Wahine Surf Classic is unrelated to the ECWC and will make its own new page in the history books of women’s surfing. I’ve noticed they are using several of our images to promote this event, which I guess we will take as a complement. We were awesome! And hopefully they will be too. Aloha! Entry Forms are now available! Entry forms for the 13th Annual East Coast Wahine Championships are ready! Print and mail yours in today. Deadline for entry is August 1st, or all slots filled. Guppy slots go quick, so don’t delay. Make sure to check your Saturday lunch choice. Pre-paid parking passes arealso available. Please visit our contest page for entry forms. Well it’s that time of year again and it’s not even June 1st. We have tropical depression number one on hanging just off the mid-Atlantic Coast. Winds are at 35 mph with gusts up to 45. It is generating some windswell, possibly mixed with some groundswell for the surfers up there. The depression is forecast to move out and into the open Atlantic in about 36 hours. Since it is sitting over the Gulf Stream and wind shear is light, it may reach tropical storm status for a moment. Then it should dissipate into nothing. Historically depressions that have formed in that area, have moved out, only to recurve toward the coast again. I think the water is too cold for that to happen. Enjoy the surf! The 13th Annual East Coast Wahine Championships will be held August 8th and 9th in Wrightsville Beach, North Carolina. Divisions include amatuer competition in Shortboard, Longboard, and Bodyboard. Novice for surfer girls that have never been in a contest before- any size board is welcome. And our ever popular Guppy divisions-for our surfer girls ages 10 and under. Event posters are ready and you can download one today! Please help us out by posting one in your local surf shop. Entry forms will be on-line soon. Thanks to all our sponsors- we appreciate your continued support! Check out the contest page for more information coming soon! 70 year old Kitty Pechet wins Open Women title in R.I.
Seventy year old Grand Legend Kitty Pechet didn’t let the 32 degree water temperature and 28 degree air temperature stop her from winning the Open Women’s title at the 41st New England Mid-Winter Regionals held February 20th in Narragansett, Rhode Island. Kitty is from Cambridge, Massachutes and if we can get a hold of her, we will find out more about this inspirational surfer! Narragansett’s Courtney Sutherland placed second, with Sarah Lim of Conneticut in third. Surfersvillage Global Surf News, 2 December, 2008 : – – Stephanie ‘Happy’ Gilmore has more to be happy about. Only 12 months after re-writing history as the only rookie – male or female – to claim an ASP World Title, the 20-year-old Australian has backed things up with yet another ASP Women’s World Title by emphatically winning the Roxy Pro at Sunset Beach, O’ahu, the second jewel of the Vans Triple Crown. The prodigious regularfoot, hailing from Australia’s Gold Coast, has continued to pad her legacy as one of the most naturally gifted female talents of her sport. With one event remaining for the 2008 season, Steph has already netted 4 major event wins. Coming into Sunset, Steph held a slight ratings leads over former World Champions Sofia Mulanovich (PER) and Layne Beachley (AUS). And big celebrations there were. Amongst a varied cast of family, friends, fellow competitors, and Rip Curl crew, the World Title celebration lit up the North Shore skies. Categories: Ocean\'s oasis, Women\'s Pro Tour. Pictured: Layne Beachley (AUS), 36, former seven-time ASP Women’s World Champion and current No. 3 on the 2008 ASP Women’s World Tour, officially announced her retirement from full-time competition today, effective at the end of the season. MANLY BEACH, Australia (Friday, October 10, 2008) – Layne Beachley (AUS), 36, former seven-time ASP Women’s World Champion and current No. 3 on the 2008 ASP Women’s World Tour ratings, has officially announced her retirement from full-time competition, effective at the end of the year. Beachley’s announcement comes as a surprise to the surfing community, given that the iconic natural-footer is surfing better than ever and currently challenging for the ASP Women’s World Title once again, sitting in No. 3 spot on the ratings at present. Greta Hesmer, age 8, attending second grade at Eaton Elementary School in Wilmington, North Carolina. This was Greta’s second year competing in the ECWC and she was the youngest entrant in the Grommette Shortboard division. She has been surfing since she was five years old and also enjoys skateboarding and fishing. She once caught four baby sharks, which she returned to the ocean. Rachel Callaghan, age 13, attending 8th grade at Roland-Grise Middle School in Wilmington, North Carolina. This was Rachel’s second year competing in the ECWC. Rachel plays violin and piano and says competing in gymnastics has helped her surfing. Rachel is working on a project with her cousin called A.N.G.E.L. (A New Generation Expanding Love) that will deliver stuffed animals and books to an orphanage in the Philippines. Cara Salerno, age 17, attending 11th grade at North Brunswick Township High School in North Brunswick, New Jersey. This was Cara’s first ECWC event and her first trip to North Carolina. She placed 4th in Girls Bodyboard. Cara has been bodyboarding since she was eight years old and her current favorite move is the barrel roll. Cara, an aspiring photographer, is a member of the National Honors Art Society, and enjoys capturing the action of skateboarding on film. Hilary Watters, age 17, attending 11th grade at Kellam High School in Virginia Beach, Virginia. This was Hilary’s first ECWC event and she placed 3rd in Jr. Women Longboard and 4th in Girls Shortboard. Hilary comes from a surfing family. She’s been competing since age 10 and recently took 1st place in Women’s Longboard at the ESA Regionals. She taught surf lessons over the summer, but also has a passion for the snow. She’s been touring colleges near mountains and hopes her good grades and love for math and science will get her into a good college. The ECWC was the first female amateur surfing contest on the east coast. It began in 1997 and encourages girls of all ages to experience the camaraderie of competition. 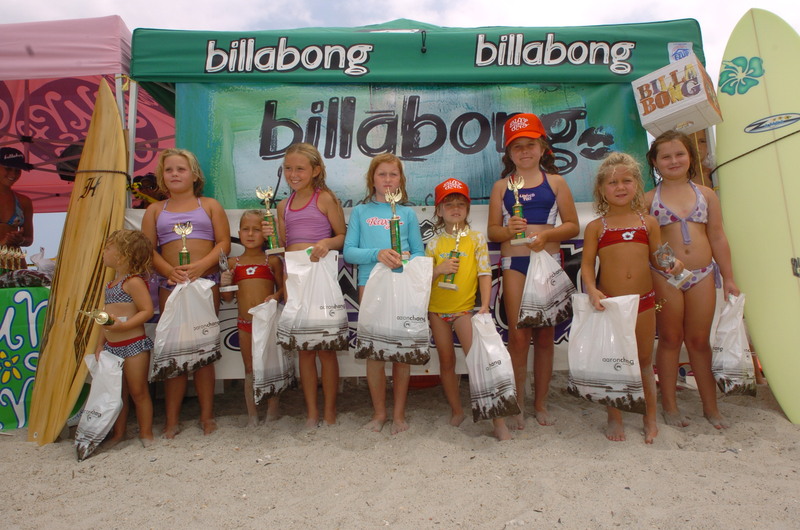 The ECWC’s presenting sponsor is Billabong Girls. Billabong sponsors the world’s best female surfers, snowboarders and skateboarders, and is committed to supporting the progression of women’s surfing, and aspiring female surfers. Pictured: Malia Manuel, 14, made history today as the youngest competitor ever to win the Honda U.S. Open of Surfing pres. by O’Neill. HUNTINGTON BEACH, California (Saturday, July 26, 2008) – Malia Manuel (Wailua, HI), 14, has claimed the GO211 LIVE featuring the Women’s Honda U.S. Open of Surfing presented by O’Neill over fellow finalist Coco Ho (North afternoon both young Hawaiians making ASP history as the youngest finalists ever at the Shore, HI), 17, in two-to-three foot (1 metre) surf at Huntington Beach Pier this U.S. Open. The Association of Surfing Professionals (ASP) World Qualifying Series (WQS) 6-Star event saw some incredible performances today, but none as impressive as the young Hawaiians taking down some of the biggest names in professional surfing. Sticking to her game plan throughout the event, Manuel started strong in the opening moments of the Final, securing two lengthy righthanders to post solid scores while her opponent struggled to find her footing in the challenging afternoon conditions. Categories: General, Women\'s Pro Tour. BIARRITZ, France (Wednesday, July 16, 2008) – Joy Monahan (Oahu,HAW), 22, became the 2008 Association of Surfing Professionals (ASP) Women’s World Longboard Champion today after winning the Roxy Jam event at La Cote des Basques in Biarritz. Monahan, who defeated runner-up Chelsea Williams (Gold Coast, AUS) in an exciting 30-minute final, posted a solid 14.10 point heat tally (out of a possible 20) to secure her first world crown in front of a cheering crowd. Monahan, who placed 9th in 2006 and 5th in 2007, stepped up this week to seize the prestigious Roxy ASP Women’s World Championships and become the first Hawaiian female World Longboard Champion. Monahan, who defeated reigning ASP Women’s World Longboard Champion Jennifer Smith (USA) in Semifinal No. 1, was unstoppable in the last heat of the event putting together strong combinations of classical turns and modern style re-entries in the two foot (0.5 meter) contestable conditions.